For Christmas, my Brother and his girlfriend kindly got me the Neom Tranquility Skin Treatment Candle - when I saw it was a Neom Candle, it's safe to say I was excited - Neom is such a lovely luxury brand, however, I usually struggle to justify spending the money on luxury candles for myself, so this gift was a real treat. Then, I realised this wasn't your standard lovely candle which just burns away - this candle was meant for skin treatment - after burning the candle and letting the wax cool, it creates an oil which you pop onto your skin for deep nourisment. Firstly, this seemed utterly bizarre, I've never known a candle to double up as a skin treatment before, but also fabulous. 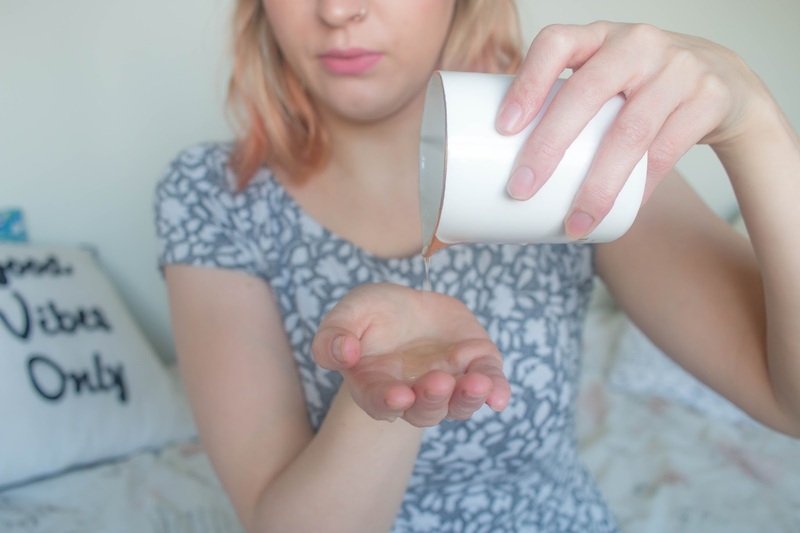 I love burning candles and my skin is often in need of some nourishment. 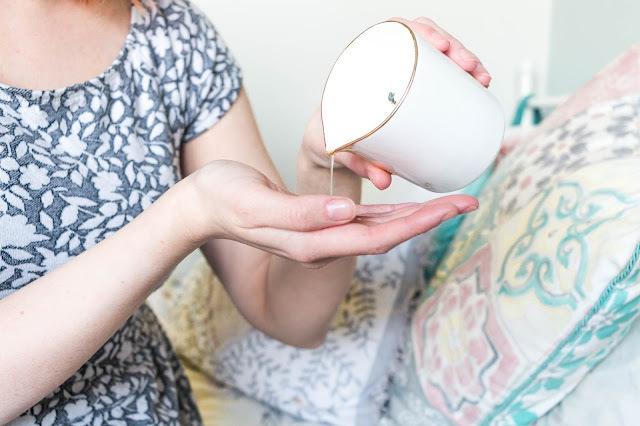 I've got the tranquilly scent, which is great to use before bed, you can smell the Lavender and Jasmine in the candle which helps to relax me and ensure a restful nights sleep, something which I usually struggle with. They also do a treatment candle in the Real Luxury scent which it's meant to distress - something I'm very keen to try! I love the scent of this candle. 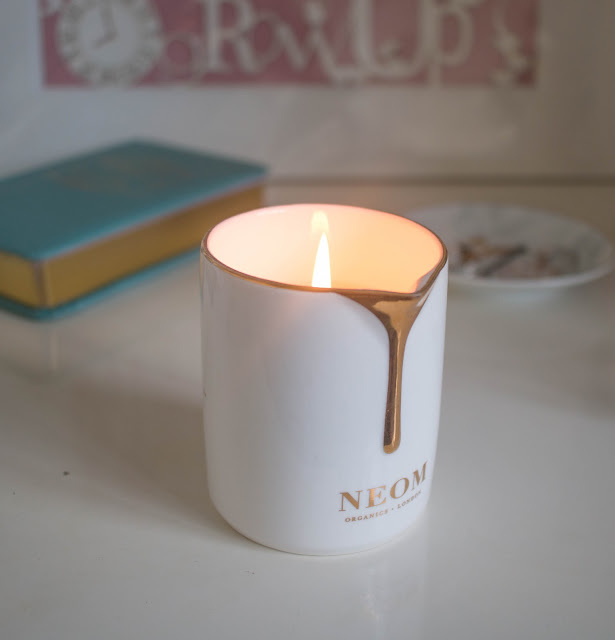 You can tell this candle is of a high quality as you can occasionally smell the candle when it is unlit, and once the candle is burning the scent can fill a room, without feeling too overpowering and headache inducing. 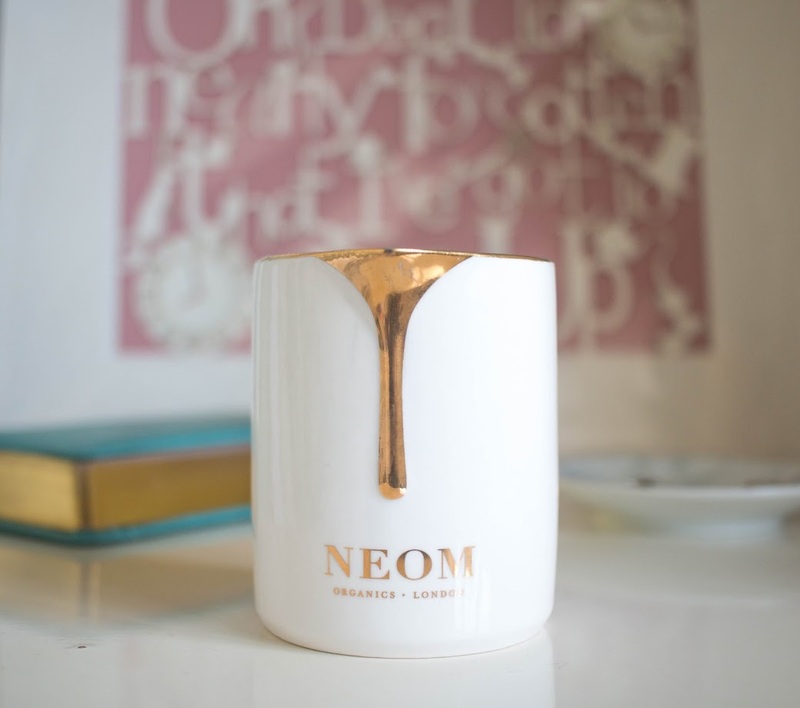 The candle is in a beautiful white jar with gold detailing, so it looks great on display and would fit nicely into pretty much any room. There is a pointed nib to make pointing the oil out easier - it also has the gold drop detailing on it, which I think is a nice little feature - overall the package of this product is fab. I opted to pour the candle on to my hands, rather than straight to where I intended to put it on the skin because that just felt a little less messy and this works just fine. The consistency is quite thick as you'd imagine, and a little bit went a long way (which I guess is a good thing because it will last so much longer), it felt slightly as though it sat on top of the skin when I first massaged it in, then it seemed to sink in and made my skin feel, and look softer almost instantly. It definitely made a difference to my skin - and it felt as though it gave my legs much deeper nourishment than your standard moisturiser. 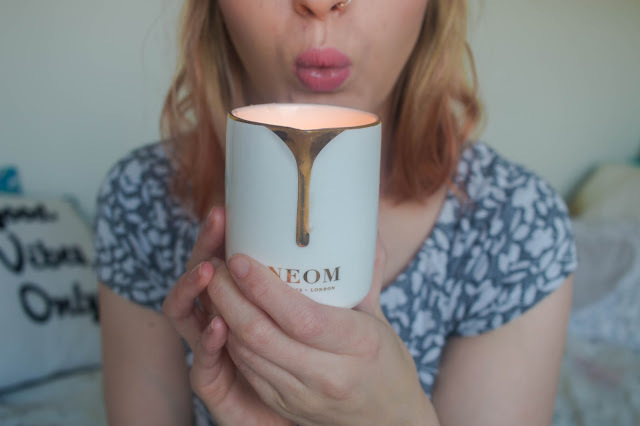 I'm really impressed with the product overall - I was sceptical as first, however, I found it does a fab job both being a lovely candle, and skin treatment, plus, it looks pretty too - I'm tempted to treatment to the other scent.